I get my vanilla beans every year, on my birthday, for free. Yep! That's right, 6 Madagascar vanilla beans, absolutely free. That's enough vanilla beans to make about a pint of vanilla extract (using the recipe in this post), which lasts me about 1 year. How do I get free Madagascar vanilla beans (and how can you get some too)? I sign up for a variety of birthday freebies from restaurants and retail stores. One of the retail birthday clubs that I've signed up for is Cost Plus World Market. A week or so before my birthday, they email me a coupon good for $10 off any purchase. This coupon is good for the entire month of my birthday. Price comparison -- grocery stores sell single vanilla beans in a plastic tube for about $10 each! So, for my $10 coupon, I get 3 packets of vanilla beans, or 6 vanilla beans. For coupons, birthday surprises (I've been receiving $10 coupons on my birthday for a few years) and alerts to special sales, you can sign up for Cost Plus World Market Market Explorers Reward program. World Market has been around for several decades (since the 1950s). I remember when they were primarily a west coast store. I shopped at one of their locations in southern California back in the 70s and 80s. They now have over 250 stores across the US. By the way, I don't get anything for telling you about them. They don't know that I exist. I just think this $10 birthday coupon is a great deal, and want to share with you. If you don't have a World Market near you, you can use your $10 birthday coupon online. They do ship, although shipping can be pricey ($4.95 for orders under $15). Still, if you used your $10 coupon and ordered 3 or 4 packets of vanilla beans (6 to 8 beans), you'd only be out-of-pocket $6.95 tops (if ordering 4 packets @ $2.99 each, less $10 coupon, plus shipping charge of $4.95). 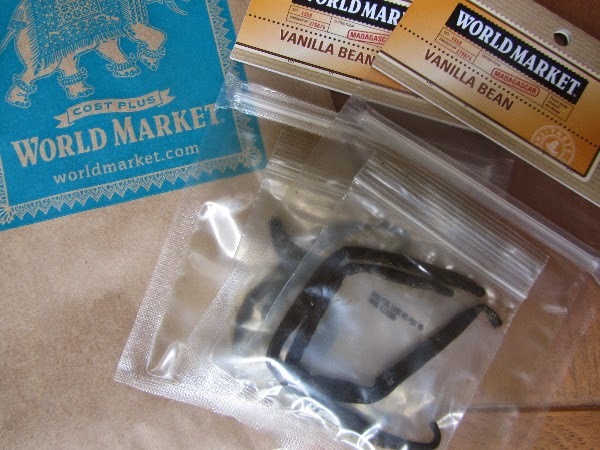 If World Market's rewards program isn't your thing, ordering vanilla beans online through other sources, like beanilla.com, ebay or Amazon is a good option. Beanilla.com offers free shipping from time to time, and their prices are very reasonable for vanilla beans. Also, many people use ebay and Amazon for buying vanilla beans. Check a couple of sources and price it out before buying. note: as of yesterday, May 14, 2014, Beanilla.com had a click-through ad in the right hand side bar, on my page here, indicating a price on Madagascar vanilla beans of $8.95 USD, free shipping for 10 vanilla beans. I don't know if that ad is still on my page. But it does indicate that they currently have some sort of free shipping promotion going on. If you'd like a couple of packets of vanilla beans, enough to make 4 ounces of vanilla extract, I'm giving away 2 packets (4 beans) to 1 winner. If you've never made your own vanilla extract, this could give you the opportunity to see if you like it. And if you already make your own, you know just how expensive vanilla beans can be -- here are a few for free! Just leave a comment in the comment section below. This giveaway is open for the next 6 days, closing at midnight PDT, Tuesday May 20th. This is open to the USA, only. The winner will be drawn randomly. I'll announce the winner on Thursday May 22nd in my regular blog post. Wasn't expecting that as you free method, lol. Doesn't look like there is a World Market nearby but there are some in the Dallas area so I might be able to visit one once a year at least. In the meantime, I've gotten good quality vanilla beans for a fair price from JR Mushrooms on Amazon a few times now. I've made vanilla in the past and would love to try it again. I'd love to freshen up my homemade vanilla with some new beans! I finally asked my very local grocery store to order me some vanilla beans a few months ago and oh my are they expensive..Will check out Amazon and other sites before I have them special ordered again. By local I mean we are less than 2000 in population and we have one grocery store and then the nearest store is 30 miles away one way and to get to a Wal-Mart we have to travel 50 miles one way. We have money near the choices you have. Oops spell check demons are on the prowl today. For the past couple of days, I've been anxiously waiting to hear how you get free vanilla beans. I never would have guessed a birthday coupon! I pinned your vanilla extract tutorial on Monday. I am so excited to try this. I think I'll use some of my Amazon gift cards from Swagbucks to order some vanilla beans. I would love to try to make my own vanilla! Very clever to get your vanilla for free you are so smart! thanks for the give away, so nice of you. This would be wonderful! I'm in! Thanks for all the helpful info. You always have such great ideas. Hope I win!! I have made homemade vanilla extract once- about a year ago and it's awesome! I love it. We go through a ton of vanilla, and those little bottles from the store are so expensive! Sign me up for your free beans! The World Market that used to be near us went out of business. However, then Aldi's moved in and I think that was a win for me. If I should happen to be lucky enough to win the beans, I think I see some Christmas presents in the future. NO world market here but I'd love the vanilla beans to try to make my own extract! How generous of you to share your vanilla beans! Please throw my name into the hat! I usually buy a pint of vanilla, its expensive but the per oz price is the best I've found. I' plan to give home made vanilla extract a try. Even if I don't win the free beans.